"When I Grow Up" - Part 2: "Lex and Friends"
We open with a prologue of the same kid from last issue. One by one, he hunts down the members of his family and kills them. Only his younger sister manages to escape. It is then revealed that the young man calls himself... Kid Amazo! Meanwhile in Metropolis, Lex has caught Superboy and Robin breaking into Lex-Tower. Lex tries to get to the bottom of the situation with the boys, as Robin cuts Superboy's line, leaving him to fall, and telling Lex that "he can't fly". Lex swoops down to save Superboy, while Robin enters the building and gets the information he is after. Superboy tries to ditch Lex, only to be caught again by him, as he drags Superboy inside to where Robin is. Ever the forward thinker, Robin informs Lex that he has set numerous explosives in the building, and makes a run for it with Superboy, leaving Lex to try and get to the explosives in time. During the escape, Superboy expresses his displeasure at being used as a distraction by Robin. Robin reveals he got what he came for, as he shows him an image on his tablet of a young man with amazing duplicating abilities calling himself... Kid Amazo! The two young heroes make their way to the town where Kid Amazo is meant to be situated according to the data they stole. When they get to the warehouse, they find the dead bodies of his family. Superboy leaps away from the building in shock and horror, while Robin stays back to investigate. Story - 5: Another solidly fantastic written issue from Peter Tomasi. He keeps the suspense and action at a high, all the while peppering in a good amount of humor and heart into the book. I love the Yin and Yang aspect of the series so far with the two title characters. Jon is certainly the heart of the book, while Damien is the brains. Damien wasn't always my favorite character, but Tomasi knows how to make you care about a brash, over confident kid who just happens to have the skills to back it up. Jon on the other hand is probably the most likable character in the entire DCU. Like his father, he possesses an awesome amount of power, yet he isn't corrupted by it. I enjoyed the fact that Damien clearly used Jon as a distraction to keep Lex busy, knowing that he would show up in his power armor, what better way to get him out of the picture for a little while, than throwing a kid with an "S" on his chest at him. He clearly played on Lex's obsession over all things Superman. I also loved the mention of Damien's ties to the Teen Titans. Even though this book centers on Jon and Damien, they clearly belong to a wider universe. I always love when a book acknowledges another, it gives it that universal vibe. With issue one being very vague on who Kid Amazo turned out to be, it was nice to learn about him a little more here, about his powers and how he got them. Clearly the story took a darker turn, with Kid Amazo murdering the rest of his family, and the boys finding them the way they did. It is certainly "one way" for Jon to learn of how ugly the outside world can be. Some may not agree with me on that one, but with modern storytelling the way it is in comics, it's a lot better than what other comic companies portray in regards to super powered kids. Just check out Invincible from Image as an example. (Just to be clear, I also love the Invincible series). There will obviously be a showdown with Kid Amazo and the boys, so that's exciting, but with Superman and Batman showing up at the end of the issue, I'm excited to see what the "dad's" reaction will be towards the boys. I'm especially looking forward to Clark's reaction to Jon coming face to face with Lex. Last month I stated that this was reminiscent of the Young Justice title DC had from the late 1990s and early 2000s. I still stick with that statement, as that was a favorite book of mine back then. This has fast become a favorite book of mine today. 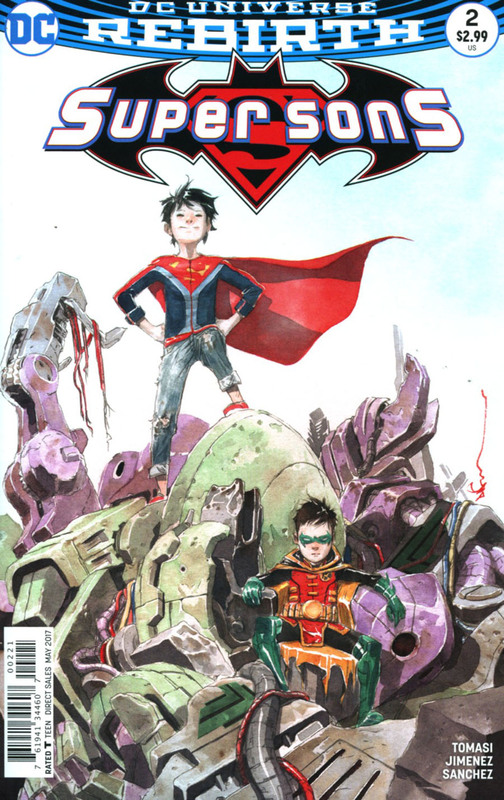 Aside from the Superman books, which are absolutely amazing right now, Super Sons and I'd have to say Redhood and the Outlaws are the books I look forward to reading every month. Art - 5: Jorge Jimenez... What more can I say about his art that I already haven't from last month's issue. He is a perfect fit for this series. Much like how Tomasi manages to juggle many aspects such as spectacle, heart and humor, Jimenez manages to blend a good dose of moody styling and animated expressiveness to really bring this book to life. If this book were to be likened to any animated series, I would have to say it is very close to Avatar: the Last Airbender. At any given moment, there can be a crazy, almost cartoonish scene or facial expression that lightens the scene and makes you chuckle. Case in point, when Jon, angry at Damien lifts him from the ground by the collar, over being used as bait and distraction for Lex, Damien shows him he found what he came for, holding his "Bat-iPad" to Jon's face while he looks away in a yawning pose. It's the very thing that makes you hate and love Damien at the same time. Speaking of Jon, there are a lot of priceless nervous smile shots of him, as he is literally picked up by Lex from the scruff of his neck. Spectacle, heart and humor are very hard to do with illustration, believe me, I know, but Jimenez flawlessly puts it on every page of the book. What make Jimenez a master at his craft, is the way he can manage to capture a scene from so many different angles. Take page one for example, we look at the boys as they dangle from the Bat-Lines through the window of Lex-Tower. I love the way Damien is standing against the glass. Also when Damien jumps down the elevator shaft, he has a very Batman like pose with his scalloped cape, reminded me of the scene from Batman Begins, when he does the same at Arkham Asylum. Jon aside from the great facials, lands that amazing kick to Lex as he tries to get away from him, and I love the Jimenez has him throw Damien aside, as he leaves the warehouse. It's what you see in animation all the time, yet on the page it can look too over the top, yet Jimenez manages to do so, without fail. Hats go off to you good sir. Before I leave I want to mention the coloring. I've stated many times before, that colorists are the unsung heroes of comics at times. Alejandro Sanchez takes the art to a whole new level with his palette. He manages to get the shadows just right, to make the world look three dimensional. He has mastered lighting separation and I would say he is probably one of the best in the business now. Best example is the scenes where Robin is on his tablet, the glow from the screen and the shine on his gloves, it's subtle, but as I said, it brings the world a third dimension feel to it. Also, I love that Lex's cod piece on his armor is red. Giving it a trunks look. 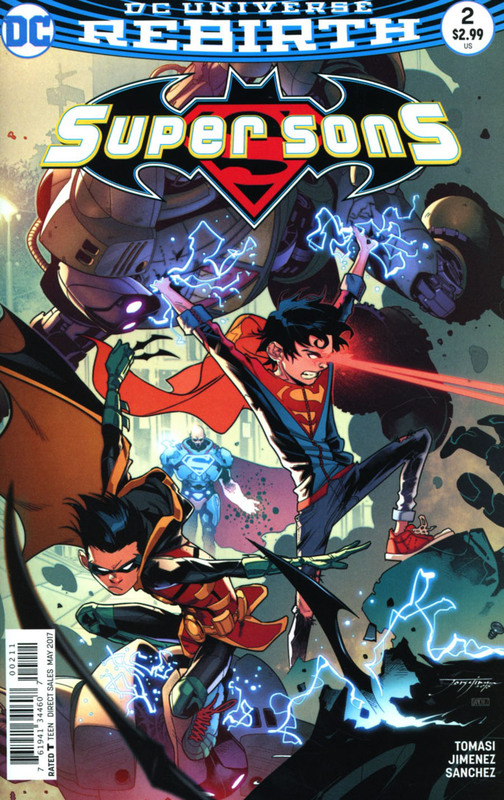 Cover Art - 5: Robin and Superboy, tearing apart some Lex-Bots! What's not to love? I love the detail, like Lex in the background charging up his gauntlet. The cover is just as good as the actual issue!